The 1661 mobile phone designed by Nokia is a solid bar designed handset with basic & user friendly features. This handset is ideal for user who wants to stay in contact with others whilst having a compact & reliable mobile phone. The casing comes in a black & grey coloured casing complete with smooth curve shaped edges. 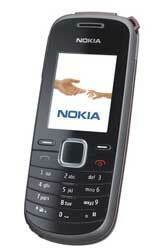 It has a colour screen & a well spaced out keypad which makes text & numeric input easy for the user of the Nokia 1661. This mobile phone only weighs eighty two grams including the fitted battery which makes it lightweight for the user to carry when not in use. The Nokia 1661 has a bar shaped design which measures 13.5mm deep, 45mm wide & 108mm tall which fits neatly in the users hand when in use. The user can input numbers & text when holding the 1661 in a single hand.